The Gangel relish their reputation as the most mysterious of the Camirilla clans, but even their secrecy cannot stand forever. Now learn the secrets of these enigmatic vampires - their history and legends, their allies and enemies, and the truth of their relationship with the fearsome Lupine. There is good reason why they stand at the forefront of every vampiric war: none can stand against them. 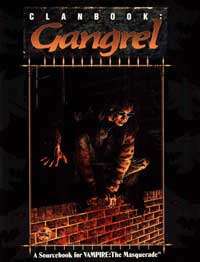 how the Gangrel run with the werewolves and the powers they gain.